Theric interviews Courtney part two: know when to say when, etc. In part one, we discussed the women of Courtney Miller Santo’s new novel, The Roots of the Olive Tree. Today we talk a bit more about writing. One thing we will not talk about is the symbolic weight of the olive tree in her fiction. I’m not sure we should let authorial intention muddy the waters on that one. Instead, just go get the novel and write your own essay on the subject. For now thought, let’s get back to the interview. Theric: One thing I find surprising about the less-enamored reviews of your novel is that they seem to be mostly griping that your story is too much like real life in that sometimes the sequence of events is not clear, sometimes events that seem important to an outsider don’t seem important to the characters, sometimes—most times?—threads don’t get tied off by the final page. Did you anticipate these complaints? What sort of discussions did you have with your readers and editors about the reality problem leading up to publication? Courtney: The question I get asked most often at book clubs and other events is “What happened in Australia?” Which, for those of you who haven’t read the book, has to do with a trip the women in the book take. I don’t go into that trip. When I was writing, it didn’t feel like a central part of the story. Everytime I tried to write it, it seemed to me like I was writing an episode of The Brady Bunch where they all go to Hawaii. Theric: When you introduced an upcoming trip to Australia I almost dropped the book. I looked confusedly at the sliver of pages left and asked aloud how the heck you hoped to fit that in there. Courtney: The women in this book belonged in Kidron and although the book flashes forward in the epilogue, it was truly supposed to be about the one year in these women’s lives that changed their relationships in an unalterable way. For me, the closure came in that every woman in the book got what she most wanted, even if didn’t work out. Now, I wish I had thought more about the unanswered questions because I feel that in many ways those are interesting questions and valid ones. This book went through many readers before it made it to my editor and none of them had a problem with the perceived importance of the events or the unanswered questions, however, I wish that they had brought it up. My editor, who is amazing, did at one point ask whether there should be an Australia chapter, but I convinced her otherwise. So, the long answer is that I didn’t anticipate those objections and I wished I had. I heard Michael Chabon speak a few years ago and he said that all of his book are about the same topic—that is, they are all about what they failed to become. I agree whole heartedly with this sentiment. Every book is a failure because the process of writing is one of translation and it is imperfect. My hope is to get better at it, and those questions have made me more conscious of plot and loose ends in the second book. I will say, however, that Roots is supposed to be true to life and I’ll never end a book where everyone gets what they want and everyone is happy. I think most great stories leave at least one character pissed (can I say pissed?) and that’s satisfying to me. Theric: I teach mostly argumentative writing, but the point remains: unlike, say, an equation which can be solved, writing we just make as better as we can until we’re done with it. Then it’s on to the next project. Moving on is as important as perfecting. Courtney: I agree. It is an imperfect medium and the best we can do is put the truth as we see it clearly on the page. Of course in teaching writing to my students, many of them think it comes out perfect the first time. I spend much of our classroom time convincing them that revision can be as beautiful as putting that first word on a blank page. Theric: That drives me bananas about students. I don’t know if I’m comforted or horrified to hear MFA candidates behave the same way. When Mormon circles were talking about the release of your book, the novel you were most compared to was Angela Hallstrom’s Bound on Earth. Not hard to see why: you’re on record liking her book, she’s on record liking your book, you both write about generations of women. But I want to talk about another similarity. Angela’s book is a novel-in-stories; yours could easily be described as a novel-in-novellas. Each of the five generations of women gets a turn being p-o-v. This building of story from stories is on my mind as I’ve just finished drafting a novella-in-stories, so I want to get into how you made your decisions—who goes first, for instance. Anna you put first—which I think was necessary as her existence is what makes the family remarkable—but I found her so compelling that Erin (whom I eventually liked quite a bit) was hard to get into at first. How did you work at balancing each character, to give her a compelling voice and story and raison d’Ãªtre and the ability to compete with the four other women for my affections. I mean—my gosh!—way to make things harder on yourself! Courtney: I believe deeply that the structure is as important to a novel as the content. In a truly great book, the structure echoes the content and amplifies it for the reader. This is not to say Roots is a great book, but I did give much consideration to the structure. The first draft of the book had each of the women in order, but my teacher and mentor, Tom Russell, pointed out that I was unnecessarily restricting myself by adhering to genealogical order and chronological order. Once I started to move the sections around, I began to feel the women talking to each other in a way they hadn’t before. Because my goal was to try to reflect my own personal experience of finally connecting with my own mother once I heard my grandmother’s and great-grandmother’s stories about her childhood and adolescence, I always wanted to tell this particular story from each woman’s point of view. At the time I was reading Jonathan Ferris’s Then We Came To The End, which is written in collective first person and what I tried to do was use the various points of view of each woman to give the sense that they were individuals, but also they were a group. Can I give a shout out to Angela? I read Bound on Earth my first year in the MFA program at Memphis and I felt like I’d been struck by lightning when I finished it. 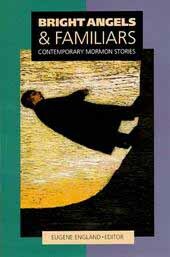 The book is exactly what I’d always hoped Mormon fiction could produce. It remains one of my favorites. Everyone loves Angela. How can we help ourselves! Tomorrow we’ll delve into family secrets and the growing science of immortality. The link for part three will be live tomorrow. Author thmazingPosted on 04/03/2013 Categories Interviews, LiteratureTags angela hallstrom, Bound on Earth, Courtney Miller Santo, Jonathan Ferris, Michael Chabon, The Roots of the Olive Tree1 Comment on Theric interviews Courtney part two: know when to say when, etc. Note for those wondering when my next Bright Angels & Familiars post will be: not until the Mormon Lit Blitz has ended. Let’s all head over now and get caught up! For Christmas, I gave my mother a copy of Bound on Earth and my father a copy of On the Road to Heaven (the links are to my personal reviews of those books as written when I first read them). I had intended to write inside them why I was giving them these books (I matched them carefully, book to parent), but I never got around to it, so they were simply wrapped and handed over at my brother’s house and we never even spoke about them. As I mentioned a little while ago, my wife and I were asked to speak in Sacrament Meeting yesterday. At Theric’s request (and because I decided to approach the topic of Latter-day Saints and language and discuss Angela Hallstrom’s Bound on Earth), I’m posting a slightly revised version of my talk here. On June 16, 1844 at a meeting assembled in the grove just east of the Nauvoo Temple, the Prophet Joseph Smith stood to deliver one of his final sermons. Wet with rain, surrounded by apostates, many of whom wanted him dead, and sustained by the saints, he spoke plainly and courageously of the Christian Godhead and “the plurality of Gods,” truths that would in part lead to his martyrdom almost two weeks later.